Place 16credit from the bank on Liberated Account when it is installed. 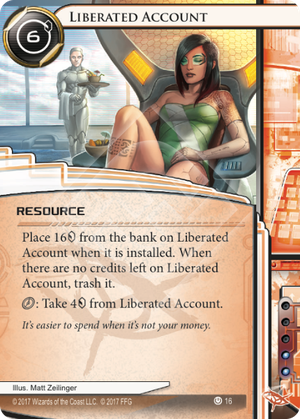 When there are no credits left on Liberated Account, trash it. click: Take 4credit from Liberated Account. It's easier to spend when it's not your money. Do you like the burst economy of Sure Gamble? Gaining 4 in a single is about as good as you can hope for and Liberated Account lets you do that four times! Plus, it doesn't even need the that Magnum Opus requires. Interesting card to play with The Supplier. You can host it on The Supplier at any time. When you're ready, you install it and gain +12 credits in a whole turn. It might be a better use of 2 influences than Lucky Find. In the charred hellscape that is post-rotation/banlist Netrunner, people are looking for ways to rebuild their runner economy. Luckily for Anarch, Liberated Account has been spared from rotation and makes their choices a bit easier. Compare to Armitage Codebusting, which can be considered the template for this sort of card. Armitage is easy to install, nets you 11, but takes a whopping six clicks to do so. Liberated Account costs a steep 6, but nets you 10 in four clicks. Clicks are more valuable than credits, and the ability to burst up is powerful when you need credits immediately. The 6 install cost is awkward, but not actually hard to attain, and you'll regain your tempo next turn. Liberated Account is clearly the better card, but basically limited to Anarch, as I don't see people spending influence on it when every faction has some form of economy. Also consider the in-faction Day Job, which has been making a slight reappearance lately. Net 8 for one full turn of clicks, with a 2 barrier to entry. The inflexibility is annoying and the payout is less, which I think far outweighs the lower cost. Plus working hard is for chumps. Most of the other options are geared towards more specific strategies, whereas this one can slot into just about any Anarch deck. The 6 install is less painful if you have a healthy economy in general - ramp up to it with Daily Casts, don't hit zero, etc. Also works well with The Supplier and Career Fair. Obviously you should be wary of tags, but even then you can empty most of it risk-free in the same turn. For now, at least, this is a staple in Anarch.